Dr. Aydogan Ozcan received his Ph.D. degree at Stanford University Electrical Engineering Department. After a short post-doctoral fellowship at Stanford University, he was appointed as a research faculty at Harvard Medical School, Wellman Center for Photomedicine in 2006. Dr. Ozcan joined UCLA in 2007 and he is currently the Chancellor’s Professor at UCLA and an HHMI Professor with the Howard Hughes Medical Institute, leading the Bio- and Nano-Photonics Laboratory at UCLA Electrical Engineering and Bioengineering Departments, and is also the Associate Director of the California NanoSystems Institute (CNSI) at UCLA. Dr. Ozcan is elected Fellow of the National Academy of Inventors (NAI) and holds 39 issued patents and more than 20 pending patent applications for his inventions in telemedicine, mobile health, nanoscopy, wide-field imaging, lensless imaging, nonlinear optics, fiber optics, and optical coherence tomography. Dr. Ozcan gave more than 50 plenary/keynote talks and 350+ invited talks and is also the author of one book, the co-author of more than 500 peer reviewed publications in major scientific journals and conferences. In addition, Dr. Ozcan is the founder and a member of the Board of Directors of Lucendi Inc. and Holomic/Cellmic LLC., which was named a Technology Pioneer by The World Economic Forum in 2015. Mobile diagnostics product lines and related assets of Cellmic were acquired by NOW Diagnostics Inc. in 2018. 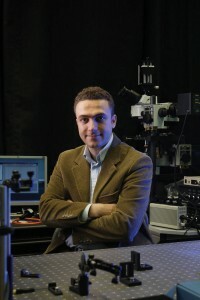 Prof. Ozcan received several major awards including the 2011 Presidential Early Career Award for Scientists and Engineers (PECASE), which is the highest honor bestowed by the United States government on science and engineering professionals in the early stages of their independent research careers. Dr. Ozcan received this prestigious award for developing innovative optical technologies and signal processing approaches that have the potential to make a significant impact in biological science and medicine; addressing public health needs in less developed countries; and service to the optical science community including mentoring and support for underserved minority undergraduate and graduate students. Dr. Ozcan also received the 2015 UCLA Postdoctoral Scholars Mentoring Award for his commitment to training and mentoring of postdoctoral researchers. In addition to these, Dr. Ozcan received the inaugural Rahmi M. Koc Science Medal, the International Commission for Optics (ICO) Prize, the inaugural SPIE BioPhotonics Technology Innovator Award, the Army Research Office (ARO) Young Investigator Award, SPIE Early Career Achievement Award, NSF CAREER Award, NIH Director’s New Innovator Award, the Office of Naval Research (ONR) Young Investigator Award, the IEEE Photonics Society Young Investigator Award and the MIT’s Technology Review TR35 Award for his seminal contributions to near-field and on-chip imaging, and telemedicine based diagnostics. Prof. Ozcan is also the recipient of the 2016 IEEE Photonics Society Distinguished Lecturer Award, 2013 and 2015 Microscopy Today Innovation Awards, 2012 Popular Science Brilliant 10 Award, 2012 National Academy of Engineering (NAE) The Grainger Foundation Frontiers of Engineering Award, 2011 Innovators Challenge Award presented by the Rockefeller Foundation and mHealth Alliance, the 2010 National Geographic Emerging Explorer Award, the 2010 Bill & Melinda Gates Foundation Grand Challenges Award, the 2010 Popular Mechanics Breakthrough Award, the 2010 Netexplorateur Award given by the Netexplorateur Observatory & Forum in France, the 2011 Regional Health Care Innovation Challenge Award given by The von Liebig Center at UCSD, the 2010 PopTech Science and Public Leaders Fellowship, the 2009 and 2016 Wireless Innovation Award organized by the Vodafone Americas Foundation as well as the 2008 Okawa Foundation Award, given by the Okawa Foundation in Japan. Prof. Ozcan was selected as one of the top 10 innovators by the U.S. Department of State, USAID, NASA, and NIKE as part of the LAUNCH: Health Forum organized in 2010. He also received the 2012 World Technology Award on Health and Medicine, which is presented by the World Technology Network in association with TIME, CNN, AAAS, Science, Technology Review, Fortune, Kurzweil and Accelerosity. Dr. Ozcan is elected Fellow of AAAS, SPIE, OSA, IEEE, AIMBE, RSC and the Guggenheim Foundation, and is a Lifetime Member of AAAS, SPIE and OSA.